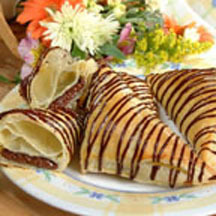 For simple elegance in the morning or evening, croissant lovers will enjoy this puff pastry filled with milk chocolate chips and drizzled with a sweet chocolate icing. A finalist in the 2000 Share The Very Best Recipe Contest, this recipe was submitted by Constance Ipema of Orland Park, Illinois. Preheat oven to 350°F (175°C) . Grease 2 baking sheets. Unfold one pastry sheet on lightly floured surface. Roll out to make a 10-inch square. Cut into 4 squares. Place 2 tablespoons morsels in center of each square. Brush edges lightly with beaten egg and fold squares to form triangles. Press edges to seal. Place on prepared baking sheet about 2-inches apart. Repeat with remaining pastry sheet. Brush top of each pastry with beaten egg. Melt baking bar and butter in small, microwave-safe bowl on HIGH (100%) power for 30 seconds; stir. Microwave at additional 10 to 20-second intervals, stirring until smooth. Stir in sugar. Add water, stirring until icing is smooth, adding additional water, if necessary. Drizzle icing over pastries.